Always travel with hummus. That’s my advice to new vegans and to anyone trying to eat healthy on the road. Having hummus in a small cooler saved us last month when my family went to New Orleans for Mardi Gras. With the streets and streetcars closed for parades, we were limited to restaurants we could walk to, and because it was Mardi Gras, all of the vegan-friendly ones that were close enough were closed. So we ate hummus–hummus on carrots, hummus on crackers, hummus on bread. The best meal we had was hummus on a Subway Veggie sandwich; after dry bread and crackers, a sandwich with all those veggies tasted like something from a 4-star restaurant, I kid you not. The night before my family goes on any trip, you’ll find me in the kitchen making this hummus, which takes about 5 minutes in a high-powered blender. Up until a few years ago, I always used my food processor to make it, but once I tried the silky smooth hummus that a Vitamix produces, I’ve never gone back to the processor. The recipe is basically the same; the blender version just uses more liquid to get the blades moving, but somehow it comes out as thick as the food processor version. And the best part: if you want, you can use whole sesame seeds instead of tahini. The blender grinds them as it makes the hummus. 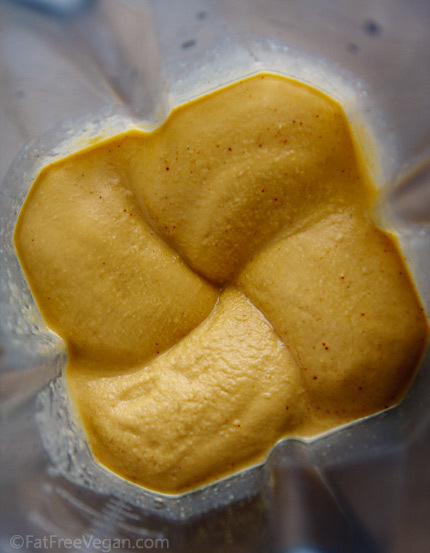 If you don’t have a high-speed blender, you can make my basic hummus in a food processor. Start by chopping the garlic first, and use only 1/4 cup of liquid. Bryanna Clark Grogan says that you can get silky smooth hummus from a food processor if you start with warm chickpeas, so if you cook your own beans, I recommend that. I like to make a a mildly-seasoned hummus for general use (and my daughter’s taste), and then scoop out half of it, add additional seasonings to the Vitamix, and blend. Since the seasonings I like to add are usually spicy, I garnish the “doctored” hummus with slices of jalapeno to let my family know which container holds the fiery hummus. The amounts of seasoning in the recipe below are conservative, so feel free to add more to taste. 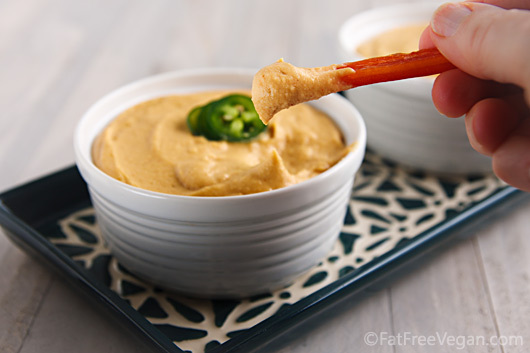 I have over a dozen flavors of hummus and hummus-type dips and several recipes where hummus is an ingredient. Find them all here. 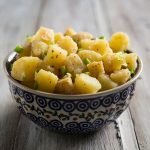 You can make this with either canned or home cooked chickpeas. If you’re using canned, I recommend using organic beans. Drain the liquid from one of the cans, but leave the other undrained and use its liquid instead of the water. If you’re using home cooked chickpeas, you may need less water so start with barely 3/4 cup and add more if the hummus is too thick. Drain one of the cans of chickpeas. Dump both cans (including liquid from one) into the blender. Place all remaining ingredients except salt in the blender in the order listed, using the smaller amounts. Start the machine on low and increase speed to high. Use the Vitamix plunger to break up air pockets and push chickpeas toward the blades, if necessary. (Other blenders: Stop and use a spatula to do this.) If the mixture is too thick, add water a tablespoon at a time. Turn up to the highest speed and blend for a few seconds until hummus is completely smooth. I often remove half of the hummus to serve as-is and get creative with the other half. Try adding any one of the following during the last brief blending: roasted red peppers, sun-dried tomatoes, chipotle chile peppers, green onions, caramelized onions, roasted garlic, jalapeno peppers, black or green olives, balsamic vinegar, spinach, smoked salt or Liquid Smoke. 1/8 of the recipe counts as 1 Smart Point on Weight Watchers Freestyle program. P.S. I’m on the road again as I write this, so it may take me a little time to approve and respond to your comments. Rest assured that I have a big tub of hummus in the ice chest! To easily remove hummus from Vitamix, instead of trying to clean the blender by hand, I swish some water in it to get all the hummus and pour into a pan to add seasonings and make delicious soup. I can’t bear to waste any of the delicious hummus left in that hard-to-clean Vitamix. It becomes the base for a great tasting soup with or without more veggies added. And the Vitamix is almost clean & ready for some soap and water. That is brilliant, Marjorie! I am a firm believer in waste not, want not and hummus enriches all foods! I have just went vegan. Having g a bit of a hard time because I am diabetic. Would you say that a normal serving size is a couple of tablespoons? Thanks for this easy low fat classic recipe. A serving would be about 6-7 tablespoons or somewhere between 1/3 and 1/2 cup. Love the sight, but I have one problem with the Hummus recipe: My daughter in law is EXTREMELY allergic to sesame, in any form. Is there something I could substitute for it in this recipe? For instance, would lime juice instead of sesame make a suitable substitute? She would dearly love to be able to eat Hummus again…and I would love to make it for her. Hi Lynn–you can always just leave out the sesame, or if you want the richness that it gives, use a nut butter like cashew, peanut, or almond butter. Even sesame butter would be a good option. I hope your daughter-in-law enjoys it! When I leave out the tahini I like to use a couple of drops of sesame oil and then liquid from bottled kalamata olives in whatever proportion you like with water. I also throw some of the olives in the blended hummus to chop slightly before serving. I skip the cumin when I use the olives. I use my Vitamix to make veggie smoothies / juices & have begun to use hummus as a flavor component. I just happened to make one using your Berbere Red Lentil Hummus…tomatoes, cucumber, zucchini, celery, carrot & a couple tablespoons berbere hummus + salt. So tasty! (the texture is like a canned tomato juice) Though I will admit to a period of time getting used to the mix…kind of like adjusting to green smoothies. The more I drink them, the more I like/love them. my point was to be, that in using the Vitamix for hummus, I would be inclined to add a bit of water to the dab of hummus left in the container & blend; put in the fridge…saving it for the next veggie “juice”. I just made this and I love it! I also added about a 1/4 cup sun dried tomatoes and that really amped up the flavor. I’m so excited to explore your other recipes! I read all the mentioned above, but I do not know how it tastes. The Hummus I know is a little different than the above. Tuheeni must be more than 2 t spoons for such quantity and must be broken aside in a different dish by adding first a little lemon juice and stair by a spoon then u add a little more juice and stair again, at the beginning the hummus looks to be hard u keep adding juice and stair till the tuheeni become loose and whiter in color add a little water less than what u mentioned. The secret of a delicious dish of Hummus is with this Tuheeni preparation . Then add the garlic and mix all with the gounded hummus. I do not put any thing else beside salt and olive oil on the top of the plate. Hello and thank you for what sounds like a delicious and easy recipe! I am going to be making it this weekend! I don’t know if this has been asked but should I use whole or ground cumin? It’s one of my favorite spices so I have both. Use ground cumin. It will come out much smoother. Hope you enjoy! Thank you! I’m making 2 batches, one with triple garlic and one with sun dried tomatoes. Can’t wait! Great recipe! Just made it today. The paprika gave it a nice flavor. No tahini since my son is allergic. We’ve also used sunbutter instead of peanut butter due to allergies as well. I’m going to be making lots of hummus since I found the joy of using chick pea water to make vegan meringues! Too many beans left over! Wish I could trade my beans for some else’s bean juice! Thanks for this great recipe! I don’t understand how the hummus recipe can be fat free if it contains tahini. Tahini has a lot of fat in it. I don’t have a Vitamix but have a Preethi mixie. Does anyone know if that will work? It’s not a regular blender/processor but it’s not a Vitamix either. My rather lightweight Hamilton Beach blender did OK. Working from homecooked dry chick peas, it *did* need more fluid and still did not blend perfectly. The taste was great. Next time I will probably make a half batch, or blend the chick peas, mix that with the other ingredients in a bowl, then blend it again in smaller batches. I wouldn’t use it after 2 weeks. I thought my regular food processor would make good hummus. It made grainy hummus until I read on someone’s recipe blog to not forget to spend a little extra time and pinch the seed coverings off the chickpeas. It made all the difference. Now it is perfectly smooth like store bought. I had no idea my hummus could be so much better. Maybe this will help someone else. I admire your patience and persistence. I think my chick peas had no skins, at least the hummus wasn’t grainy. Given how labour intensive your process is, I think I would have settled for graininess! I take it back, the top half of the batch was kind of grainy, but I was just using a rather lightweight blender. Even with a lot of manual stirring it didn’t blend quite evenly. I had to let the machine rest quite a bit to avoid burning out the motor! I have only myself to please so its good! Yummy and amazingly easy. You are one of this new vegan’s go-to sites!!! I love hummus and as a vegan I am interested in finding hummus that has no tahini or oils. I didn’t like the roasted pepper version that is available at Sprouts as it’s too darn spicy for me. I like all the other flavors, especially the sun dried tomato and the roasted garlic. If you know where I can order tahini and oil free hummus that does not include hot pepper, please tell me. This recipie was delicious! Can you freeze it if you make in bulk? I really like this hummus recipe with the spices you used. My daughter loves hummus and its gets her to eat carrots so I am going to try your variation. I am a novice hummus person. Just recently discovered how easy and convenient it is while also being delicious. I want to jump right in and make some but I have a question. I would like to make it with variations (which you have lots of) but I’m not sure how to do the one I want to try. I have a package of dried Craisins which the package describes as “sweetened, sliced, dried cranberries. Do I need to soak the cranberries before I mix them with the beans or do they do in as is? I also have canned cranberries. How would I use them-ammount? Any help you can give me will be greatly appreciated! I’m excited about making my own Cranberry Hummus! I would soak the dried cranberries to soften them and use the canned cranberries right out of the can. Just add them a little at a time until you get the flavor you want. I’ve tried other oil-free hummus recipes before, and none comes close to this. I just made a batch exactly as described, adding a couple spoonfuls of kalamata olives at the end. It’s just heavenly. Thanks for sharing your gift with us. Just made this and had to thank you for sharing such a great recipe! 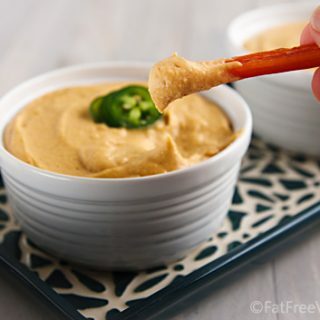 We go through so much hummus at home- this recipe made a huge batch at a third of the cost and my husband was so impressed with how great it tastes! I used the ninja and it came out so smooth and creamy. I’ve been looking for ways to cut down on oils too so perfect all around!! Thanks again!! 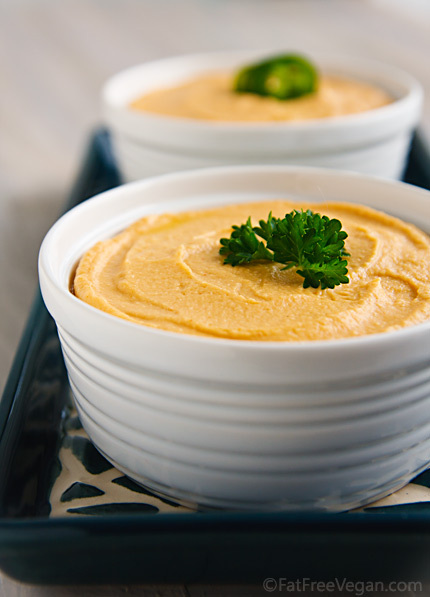 This is my go-to hummus recipe! Thanks Susan! I’ve made this many times but finally decided I’d better chime in with the verdict: YUMBO!! Hubby Bill loves it too so that makes it a keeper! So easy to make — I just use my Oster but it does an awesome job! Wait! People actually have hummus a week later?!?! When looking at calories, how much is 1 serving? Is this calculated using tahini or sesame seeds? Chicpea cooking liquid or aquafaba? I find that it makes around 3 cups, so a serving is about 1/3 cup. The nutrition is calculated using tahini and chickpea liquid from a can. Just came across this recipe and oh my goodness I think this is the best hummus I’ve ever had!! This is my new go-to recipe! The smokey-ness from the chipotle, cumin and paprika is heavenly. And I’ve never had home made hummus that was this smooth before!! Delicious! USE MORE TAHINI FOR A MUCH BETTER FLAVOR!~ I CAN EAT HUNNUS EVERY DAY TOO! SO GOSH DARN DELICIOUS – BUT 2 TABLESPOONS OF TAHINI IS NOT NEARLY ENOUGH! It would be helpful to know –how large is a serving? Love this hummus! I have made this so many times I know the recipe by heart. I also love that there is no oil & sometimes I omit the tahini for an even lighter snack. Oh my goodness! I have been looking for a hummus recipe that rivals my favorite store bought. You nailed it! I used max spice and added roasted red pepper. I am in Hummus heaven. Easy to make and fresh and tasty. I will never go store bought humus again. Hi, Susan – I love your site, refer to it all of the time. I am cooking fat-free vegan lentils now, using some elements from your lentil stew recipe. I make hummus all the time and I make it without tahini, which is high fat. It’s not as silky of course, because fat has a wonderful texture and mouth feel – but it’s hard to enjoy after a heart attack or a diabetic-induced stroke. It is delicious even without any added fat. Sometimes I make it just with salt, garlic, and lemon juice, but if you like the taste of pesto, just add some fresh basil and let the food processor rip. HI 🙂 I just wanted to share a delicious variation with you. 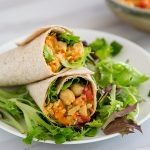 I sub one of the cans of garbanzo beans with a cup of cooked red lentils and boost up the spice level. Creates a delicious earthy/spicy version if you like that kind of thing. And super easy too, I make it all the time. This is my go-to recipes for hummus. I have tried others but always come back to this. Love the olive variation. Hummus. It is such a good thing. Thanks for the recipe, Susan! I forgot the chipotle, but it is still very good! This was great. I made a double batch in food processor using home cooked garbanzos. (Soaked overnight in water with 1/4 tsp baking soda, and cooked in crockpot on low all day–because that was convenient for my schedule..) I used the middle of your suggestions for spices/lemon juice.. This is the first time I have been successful at making hummus. It is delicious. Thank you so much for this recipe. so how long does healthy homemade hummus last in the fridge? I’m not sure how long it remains safe because I have an aversion to eating anything after a week. But I would guess 1-2 weeks. This came out amazing! I stuck to the recipe as given only subbing aleppo pepper for the cayenne. Tasted then upped to the larger amounts given for the cumin, lemon juice, garlic but I did add an additional half tablespoon of the tahini! Really good, Since going vegan 4 months ago, I have tried making several other fat-free & minimal oil hummus recipes I’ve found on line and this one is the keeper. Thanks again, Susan! If I want to make pumpkin or butternut squash hummus, would I just add some of either to this recipe? How much would you suggest? Made a half batch in my Magic Bullet – came out perfect. 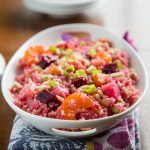 I loved using whole sesame seeds instead of tahini – less messy! Another thing that makes it silky smooth and I have been doing it this way for years- I microwave the chickpeas, garlic, and chickpea liquid until it’s really hot ( a few min) then I add lemon juice, tahini etc. it purées in the vitamin like magic then!!! So smooth! 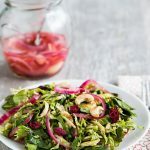 This is an excellent example of a good recipe to use as a starting point, as the author suggests. I suppose you could even try subbing lentils for chick peas! (I haven’t tried that so you are on your own.) I’d steer away from potting soil, though, that would turn your hummus into humus.